Tunisian women are representatives of the beautiful and mysterious African country. These picturesque and attractive Arab women carefully keep traditions of the people including in that sphere which concerns female appearance. Beautiful Tunisians have a typical figure, skin color and a hair. They often remind the beautiful fine-molded figurines differing in soft and womanly lines. As well as other Arabs, Tunisians differ from Europeans in features, proportions and lines of a figure, a behavior manner. Traditionally women of Tunisia have swarthy skin, smooth and silky, dark hair and eyes. A large number of women, as well as many centuries ago, uses only natural cosmetics including for a make-up. Beauty of Tunisian women is often hidden under national clothes. These are unchanging folk traditions. And only a part of modern girls who got the European education build professional career, let themselves open and daring clothes. Beautiful Tunisian women have the oval or extended facial features. The Arab section of eyes is harmoniously combined with such form. A look of dark and huge eyes, very womanly and mysterious, attracts men, especially foreigners. Also, the extended nose with wide nostrils, complete lips of a beautiful form is characteristic of appearance of the Tunisian. The dark face is charmingly bordered by silky dark hair: black or dark-chestnut. The whole appearance of many women in Tunisia resembles traditional national dishes: it is as spicy, expressive, “delicious.” But it is worth noting that among the representatives of the country a lot of ladies do not differ by feminine appeal. Therefore, beautiful Tunisian women are very much allocated in crowd. And especially they look effectively and impressively at beauty contests, the brightest and charming girls get out to such competition. And especially they look effectively and impressively at beauty contests. The brightest and charming girls participate in such competitions. Tunisians whose beauty is often hidden under long and faceless attires try to decorate interestingly at least those parts of a body which remain visible. In particular, it is possible to see often the hands of women painted with natural dyes. Graceful patterns fascinate, attract a look of people around. The Tunisian women, in comparison with representatives of other Arab countries, feel more confident and protected. They on an equal basis with men get an education, many of them work and help the husband with providing a family. But this does not prevent them to pay much attention to the care of the family. Tunisian women at early age, as well as other girls, dream of career of singers, actresses, models. And now on fashionable displays beautiful Tunisian women often represent collections of the most eminent designers. 15. Hiba Telmoudi (род. 1992 г) - Miss World Tunisia 2013. 13. Hend Sabry (born November 20, 1979) is a Tunisian actress. 12. Shayma Helali (born May 3, 1985) is a Tunisian singer. 11. Kenza Fourati (born 1987, Lille, France) is a Tunisian-French model. In 2002, he took third place in the contest "Elite Model Look" and signed a modeling contract. 10. Feriel Graja (born December 11, 1980) is a Tunisian actress. 9. Sonia Ben Ammar (born February 19, 1999) is a French singer and model of Tunisian origin. Sonia became better known after began dating Brooklyn Beckham. 8. 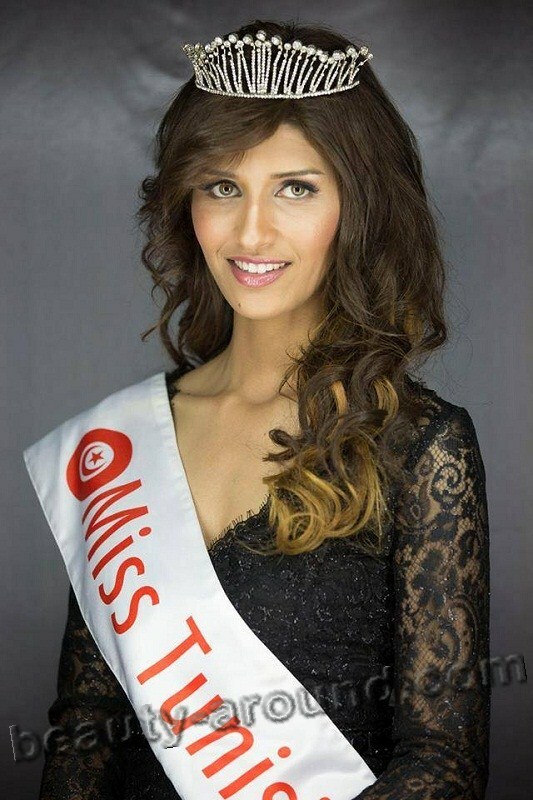 Maroua Heni (born 1992) - Miss World Tunisia 2015. 6. Hanaa Ben Abdesslem (born October 18, 1990) is a Tunisian model. She has worked with such designers as Jean Paul Gautier, Vivienne Westwood, Chanel, Oscar de la Renta, and Anna Sui. She is the first Arab model to be featured in the Pirelli calendar as well as the first Muslim spokesmodel for the French perfume and cosmetic house Lancôme. 4. Leila Ben Khalifa (born February 16, 1982) is a Tunisian actress and model. 2. Souhir Ben Amara (born November 27, 1985) is a Tunisian television actress. 1. Dorra Zarrouk (born January 13, 1980, Tunisia) is a Tunisian actress.